I’ve made it onto a few “lists” this Fall, but none more fantastic (and unearned) than this one. Thanks to John Vigna and his misguided and exaggerated opinion of my badassedness. I only hope I never have to back any of this up. This list appears on the49th Shelf website here, but I’ve posted the text below. Suppose you find yourself standing in a Calgary bar, perhaps Ranchman’s, mouthing off about your beloved Vancouver Canucks who’ve just eliminated the Flames in the playoffs (unlikely as that might be) and you’ve been shouting to be heard—the music is loud after all. A large southern Albertan ranchman hears you. He’s wearing a big white hat that shadows his eyes. His belt buckle winks in the light and you notice it’s a shiny Calgary Flames logo. You exchange a few words, but he’s not interested in talking. Instead, all hell breaks loose. Beer bottles smash on tabletops, you and the cowboy slug each other, the unmistakable stench of man-sweat and confusion floods the room. As the deafening cheers from onlookers—now the women are in on the fighting—spur on the cowboy, you consider dropping down under a table and curling in the fetal position. At this point, it’s about having the right guys to watch your back. In no particular order, these writers and their books might just help you walk away from that bar and live to fight another day. Patrick DeWitt, The Sisters Brothers: When passing through town, try to avoid picking fights at the local watering hole, but if you can’t do that, find this guy—he knows fights, he knows bars. DeWitt, author of Ablutions, reinvented the literary western with the heartbreaking tale of two gun slinging brothers hired to kill a man. It’s tragic and it’s funny-peculiar, as all bar room brawls tend to be. The good guys win in the end, but at what cost? Craig Davidson, Rust and Bone: Before you hit someone you should understand the possible consequences. Davidson once laced up the gloves and got into the ring with author, Jonathan Ames. He then fought poet Michael Knox while promoting his book in Canada. His stories are lean, visceral and as shocking in their resolutions as a well-timed haymaker. This great debut book has been made into a movie that has taken Cannes by storm. He’s also got Chuck Palahniuk (of Fight Club fame) in his corner. Need I say more? Keith Maillard, The Raysburg Series (Alex Driving South, The Knife in My Hands, and Cutting Through): Whether you win or lose, each fight changes you forever. These three books are difficult to find new—you’ll have to scour a used bookstore but it’s worth the effort. For those readers who want the newer, expanded versions of them, it’s best to check out Maillard’s series, “Difficulty at the Beginning”, four books published by Brindle & Glass. These are gritty coming of age stories set against the backdrop of the Vietnam war, tales of political and sexual rebelliousness, of growing up in the backwoods of West Virginia, and of what it means to be a man in a world where the ground shifts beneath each step. Ian Brown, The Boy in the Moon: Simple bar room logic: even if you are not looking for a fight, a fight will find you. Ian Brown is a rare writer who turns a truthful eye on everything, especially himself and in doing so is not afraid to give us the non-PR version in a world hell-bent on the sanitized truth. This deeply moving and personal book concerning his relationship with his son is all about fighting for the right to live, the right to discover your own truth, and the fight inherent in fatherhood. Steven Galloway, The Cellist of Sarajevo: If asked to check your piece at the door, it’s good to have a back up plan in place. Galloway’s characters grapple with the siege of Sarajevo in moving, human ways and infuse the book with a broad band of hope. Arrow is one of the most savvy protagonists you’ll ever come across, a reminder to cultivate friends in high places, especially those who happen to be legendary snipers. Marcello Di Cintio, Walls: Travels Along the Barricades: A basic rule for those who find themselves in a bar room brawl: stay close to an exit. Walls is Marcello’s third book, and proves what readers of his previous travelogues already know: he does whatever it takes to record the stories of those whose voices need to be heard, and does so with great empathy. Walls is a remarkable, timely achievement that explores families who are divided, but not conquered, by walls in war torn nations. Di Cintio is also a wrestler, which is bound to come in handy. Andrew Westoll, The Chimps of Fauna Sanctuary: If all else fails, the wise man knows there is no shame in backing down from a conflict. In this intelligent and moving chronicle of life at a chimpanzee sanctuary, Westoll weaves a gripping story by revealing the complex personality of each chimp and their striking similarities to humans as they interact, communicate joy, sadness and fear, and struggle with conflict among each other and with humans. The climax in this well-structured book will leave you gasping, if not weeping, in astonishment. Guy Vanderhaeghe, The Englishman’s Boy: A wise man hits first, the better man hits last. In The Englishman’s Boy, a group of men pursue their stolen horses in the Wild West and a screenwriter is commissioned to pen the story. Vanderhaeghe is a superb if not underappreciated stylist; this historical reinterpretation—the first in a trilogy that concluded with A Good Man—has all the ingredients of a great bar room brawl: intrigue and insult, fighting words and bloody fists, honour and redemption. 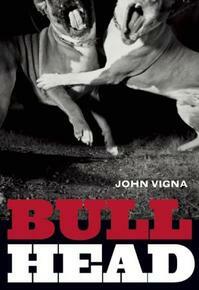 John Vigna’s debut collection, Bull Head (Arsenal Pulp Press), has been published to critical acclaim this Fall. He is the recipient of the Dave Greber Award for Freelance Writers, winner of the sub-Terrain Lush Triumphant fiction contest and finalist for a Western Magazine Award, the Event creative non-fiction contest, and the CBC literary non-fiction contest. John’s work has appeared in numerous newspapers, magazines and anthologies including Cabin Fever: The Best New Canadian Non-Fiction, The Dalhousie Review, Grain, Event, sub-Terrain, The Antigonish Review, and Exact Fare 2: Stories of Public Transportation. He lives in Vancouver with his wife, the author Nancy Lee.